My apologies for not updating the blog for the last several days; I’ve been a little under the weather and stuck mostly to leftovers and unprocessed snacks and fruits (dried apple slices, peaches and melon). 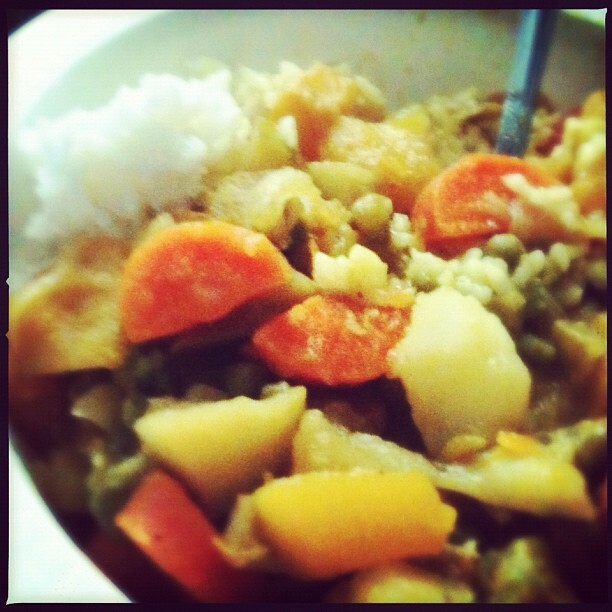 I also figured being congested would be a great time to make some curry, which is bound to help a little. 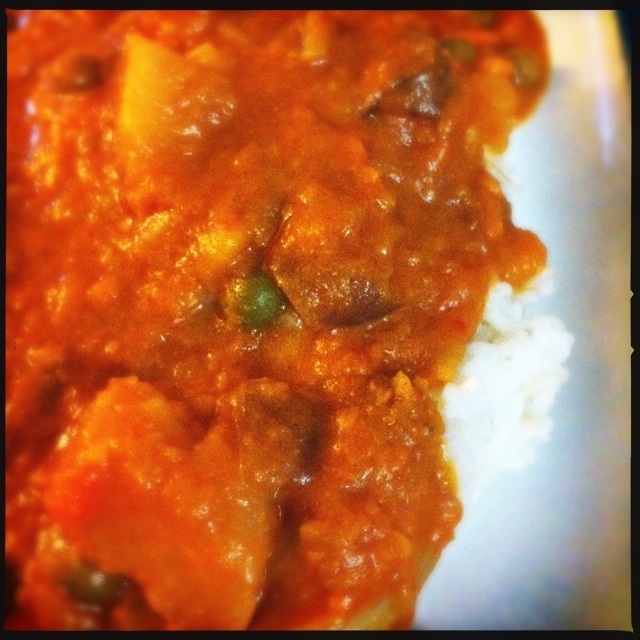 I wanted to remake the awesome vegetarian pumpkin curry I made as my $5 Slow Food Challenge last October, but there was a lovely Red Kuri squash in this week’s CSA box, and since Red Kuri is pretty similar to pumpkin, I figured it was worth a try (plus, I was really enjoying saying “Red Kuri red curry” over and over). I used the exact technique as I used for the pumpkin curry in the above link, right down to slicing and roasting the Red Kuri squash on my outdoor grill before adding it to a big crock pot full of vegetables, red curry paste, coconut milk and stock. It was excellent. I also used the fresh tomatoes from my CSA box to make some homemade ketchup (based on this recipe, but obviously I only made like two jars of it), and tried my hand at some baking … the seemingly simply four-ingredient bread recipe, but it didn’t turn out very well. Luckily, I still have plenty of all four required ingredients, so I’ll try it again later this week. As most, if not all, storebought bacon is processed in some way, I decided to make some homemade bacon, which I have done a few times before. It’s a really simple recipe that gives you delicious, nitrate-free bacon with no special equipment (other than a smoker). This week’s CSA also included a bounty of kale — even with the “small” box, each weekly delivery is too much for one person — so I decided to try using kale to make old-fashioned Southern-style greens. Usually greens are made with collard or mustard greens or chard of some sort (any sort, really), but I had never made it with kale before. Also it’s usually made with ham and/or a ham bone, and instead of ham, I use a few good slices of the homemade bacon I just made. The substitutions worked beautifully (even if this isn’t the most photogenic dish). I put the chopped kale with a chopped onion, a few heads of garlic, a splash of apple cider vinegar and a quart of chicken stock into my crock pot, and I let it cook on low overnight. I really love these $5 slow food challenges. Slow Food USA challenged chefs and food bloggers to “take back the value meal” by demonstrating that buying fast food, usually for about $5 per person, might seem like it’s saving money in the short-term, but is worse for us in the long run. Of course, slow food doesn’t cost more than fast food, it’s just … well, slow. In the past, I have blown away the $5-per-person goal with an epic slow-cooked smoked chicken posole and a simple beef phô that anyone can make. Although both of those recipes can be adapted for vegetarians by eliminating the meat, this recipe is a bit more seasonal and spicy, and frankly, it’s wonderful. It’s so thick and hearty and spicy, you won’t miss the meat. The other two challenges were also crock-pot recipes, and this only takes about 30 minutes — 45 minutes to an hour total active and inactive time, if you include the time it takes to roast the pumpkin. As you can see, most of these ingredients are available in packages that will allow you to still have potatoes, carrots, rice, etc., left over after this meal. If you just go by what this meal actually costs, i.e., the portion of ingredients you use out of the whole package, then it costs a total of $15.64, or $3.13 per serving. If you buy all of these ingredients in money-saving packages and go by what it all costs, total, including a pack of salt and pepper, the total is $29.95. That’s still $5.99 per person. Lots of you probably have a half-bag of rice, or a sack of potatoes, or an extra couple of apples lying around, or a chunk of ginger root in your freezer, to use in a recipe. I would recommend buying the larger packages if you have the means, especially for things like a jar of curry paste, which lasts a long time and is a great addition to lots of dishes. 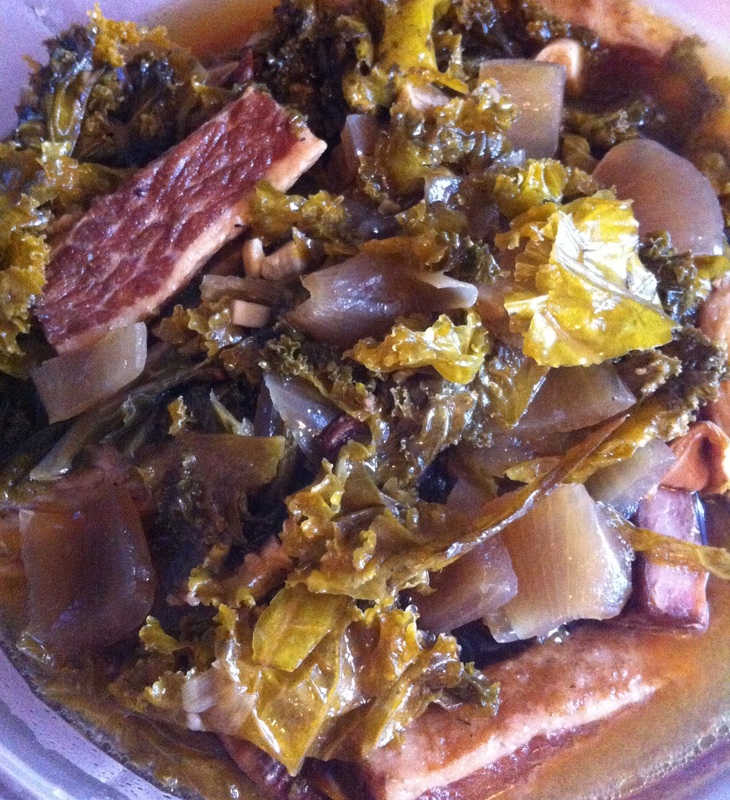 Also, if you make your own vegetable stock (try this easy way using kitchen scraps), you can save that money as well. 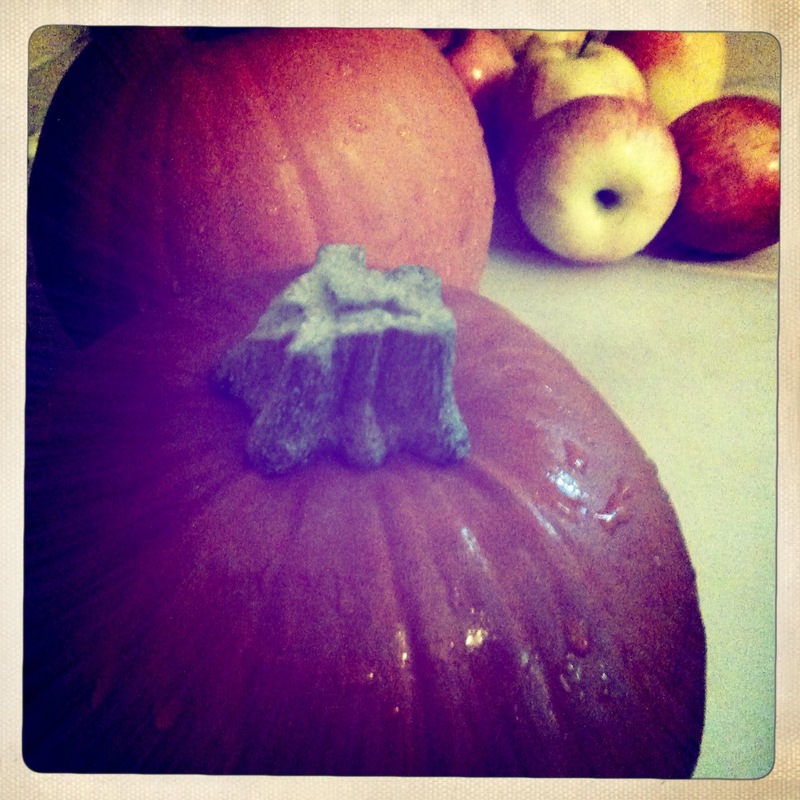 First, prepare the pumpkin. This part is fun. I took this very easy pumpkin-preparing tutorial from the Pioneer Woman’s blog and basically eliminated the last step of pureeing the pumpkin. Essentially, you slice it, scrape the seeds out (don’t forget to save them for flavoring and roasting later! 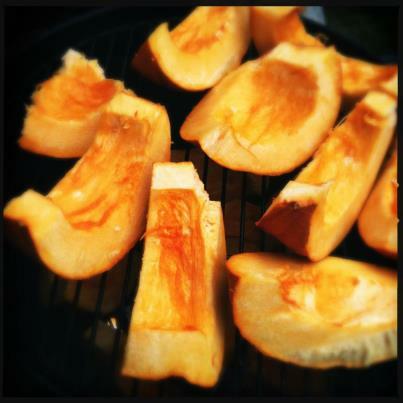 ), and roast the slices over high heat. Let it cool so you can handle it with your bare hands, then the rind comes off very easily and you can take the pumpkin for all of its tasty meat inside. This is delectable for pureeing for pies, tarts, desserts and pumpkin fruit butters, or for keeping in chunky form for curries, stews, and, as Ree Drummond explains, just for eating by itself. (It is very difficult to handle a chunk of freshly roasted, slightly warm, sweet pumpkin flesh and to NOT just pop a chunk of it in your mouth. Try to save enough for the curry.) The day I made this recipe for the first time, I roasted a few pumpkins and used some for this curry and the rest for a fabulous spiced pumpkin apple butter. While the pumpkin is roasting, chop the potatoes, carrots, apples and onion, and start it cooking in a large pot with a bit of oil. Add the coconut milk, about half of the container of stock, frozen peas, curry paste and brown sugar, and let simmer until vegetables are soft. By this time, the pumpkin should be nice and soft as well, so let it cool off a bit after you take it from the oven, then peel the rind off, rough-chop the pumpkin, and toss the chunks into the pot. Add a bit more stock at this point, as well as the salt and pepper to taste. Be sure to taste it … you might want to add a bit more sugar or pepper or stock. 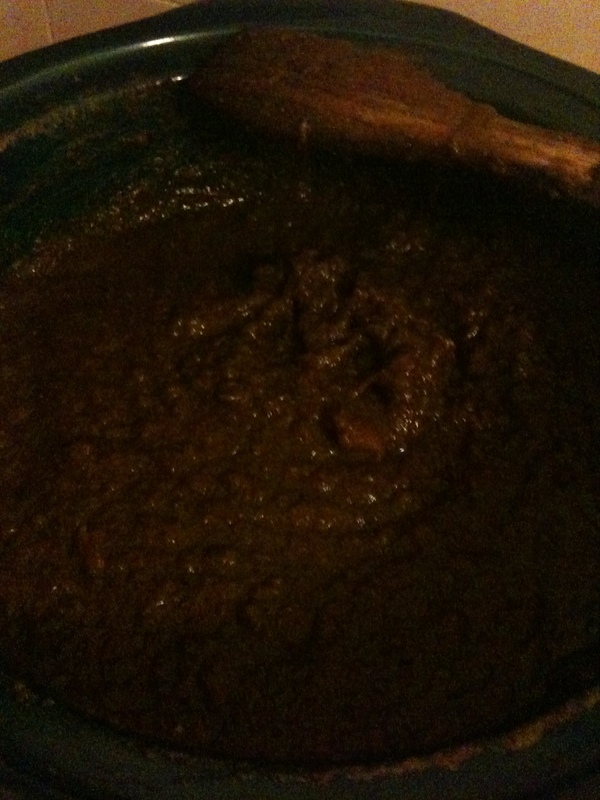 Then let it simmer for another 10 minutes or so, so that all of the flavors mix in together. 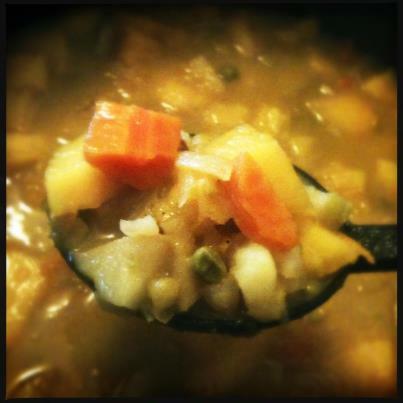 ** Rice vs. Soup: I served this on a bed of cooked white rice, but you can also stop here, and simply puree or blend these cooked ingredients into a liquid for a sweet and spicy soup. (In fact, if you aren’t feeding a house full of people on this meal, you may want to do both, just so you don’t get tired of the same dish multiple times. Even fabulous leftovers get old after you have to eat them a few days in a row.) This is delicious as a smooth, creamy soup, or as a thick and chunky curry and rice dish. I think I am pretty much on record as being a huge proponent of the crock pot, or the slow cooker. My mother and grandmother cooked in them ever since I can remember, and some of the best food I have ever eaten has been cooked for hours in one. There is simply nothing better than starting a great soup or meat dish in the morning before leaving for work, and then coming home after a long day to a hot, slow-cooked meal. I can cite a thousand excellent recipes for various chilis, soups and slow cooker dishes that I have loved since I was a kid. My favorites are this insanely easy carnitas recipe (which also cuts the fat of the dish in half) and my smoked chicken posole. 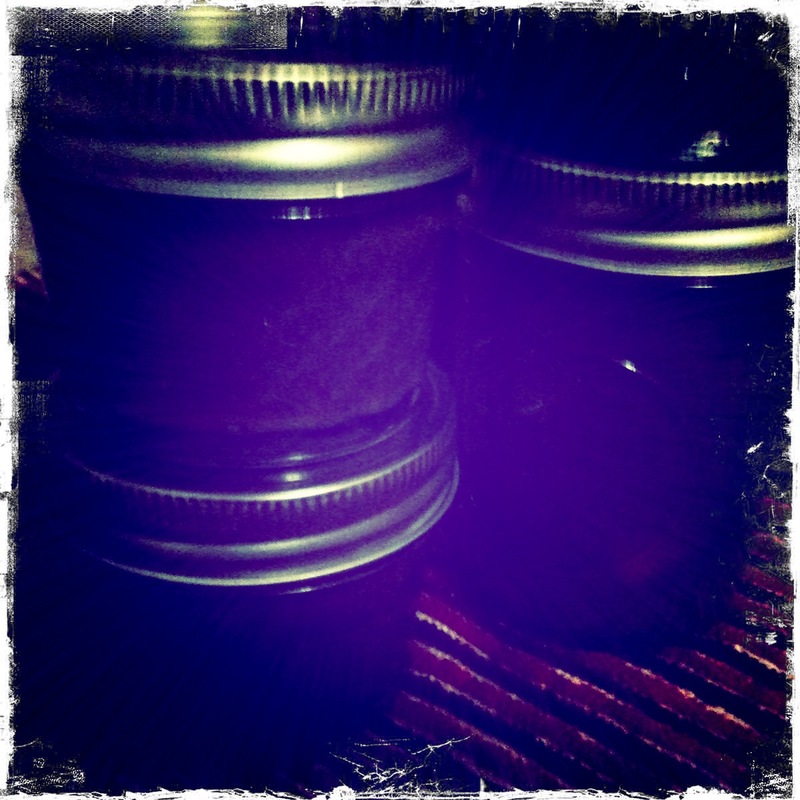 I am the proud owner of a great 5-quart slow cooker that I love, and since I started making jams and preserving, I discovered that there are also amazing jam and fruit butter recipes — once again taking the work out of cooking. Aside from being good for the recipes that aren’t even recipes (like keeping your nacho sauce or apple cider warm during a party, or putting frozen meatballs in a spicy sauce for an appetizer), it makes recipes that were previously complicated into simple comfort foods. Slow-cooked pulled pork is as easy as meat and sauce in a pot. Homemade stocks are as easy as a chicken carcass covered in water. Then you walk away and let the crock pot do all the work. After slow-cooking for about 5 hours. Do you have any idea how hard it used to be in the past to make apple butter? Imagine the poor chef, probably a tired woman with kids running around, standing over a hot stove for hours and hours. It makes me tired just thinking about it. Nowadays, the hardest thing you have to do to make apple butter (or apple-pear butter, apple-pumpkin butter, and so on) is chop up some fruit. 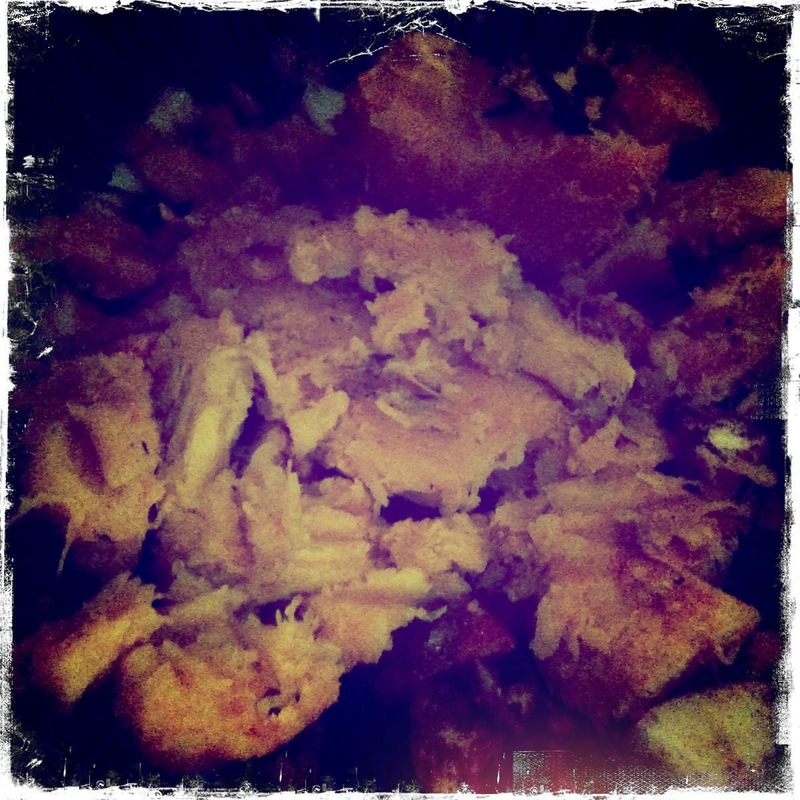 I adapted the Frontier Woman’s Homemade Pumpkin Puree — it’s amazingly easy and I didn’t even puree it at the end, I just put the chunks of roasted pumpkin in the slow cooker with the apples and spices. I barely did any work and it tastes fantastic! Start with two small pumpkins … not the big, jack o’lantern type, but the smaller ones (with more flesh) that are used for cooking. Get a nice, sharp knife, and slice off the top (stem) and the bottom, then slice it up. Roast the pumpkin over high heat. I don’t add anything — no oil, no salt, just to keep it pure — but if you know you’re using it for a spiced fruit butter or a pie, it wouldn’t hurt to add some spices before cooking to amp up the flavor. 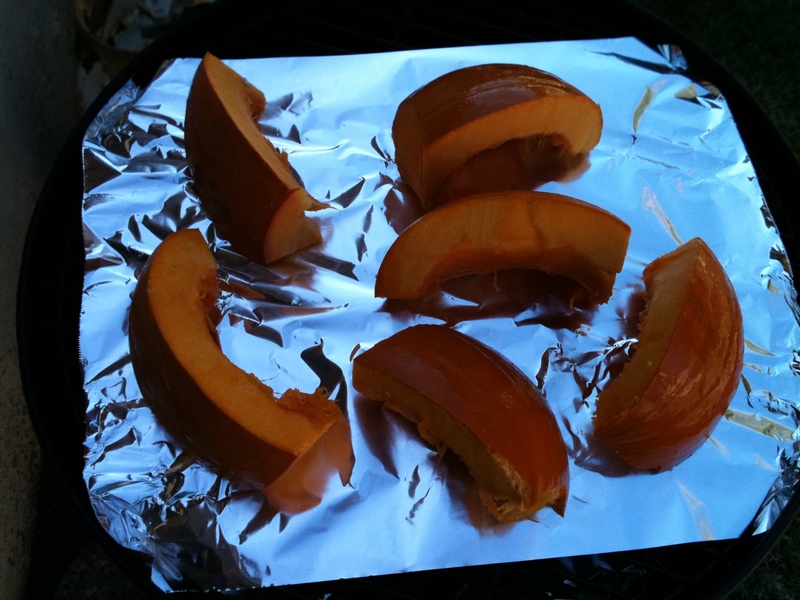 As is my favorite way to add flavor to stuff, I used my outdoor cooker to give the pumpkin just a little bit of a char. 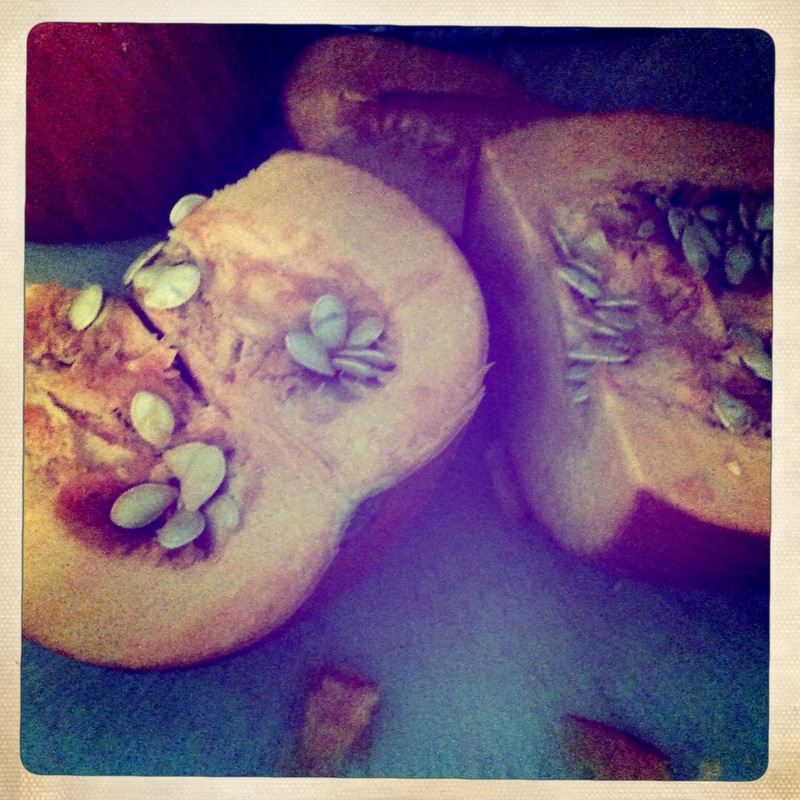 Plus … raw pumpkin smells gross — roasted pumpkin smells incredible. Once the pumpkin is fork-tender, the pumpkin rind comes off easily, and you can pull out the pure pumpkin flesh to puree and freeze for later, or add spices for a pie. In my case, I dropped it straight into my crock pot with about 8 chopped Gala apples (but use your favorite type or whatever you have on hand), and some brown sugar and pumpkin spice (ginger, allspice, cinnamon, and nutmeg). My personal method with recipes like this is to vary the amount of spices based on how much you’re making … and taste often to make sure the spices are to your liking. I think everyone would make this a little different. I set the slow cooker on the high setting and cooked it with the lid on for about 5 hours, then I pureed it with an immersion blender. You can also take it out of the cooker, blend it in a blender or food processor, and transfer it back –or, if the fruit is soft enough you can even use a good potato masher while it’s still in the pot. Some people also like their fruit butters to stay chunky, so you may not want to puree it at all (but in that case, make sure you chop up the pumpkin first so it’s evenly distributed). Then cook it without the lid for about 3 hours. Cook it until the butter is thick and syrupy, and ladle it into sterilized, hot jars, and seal in a water bath for about 20 minutes. 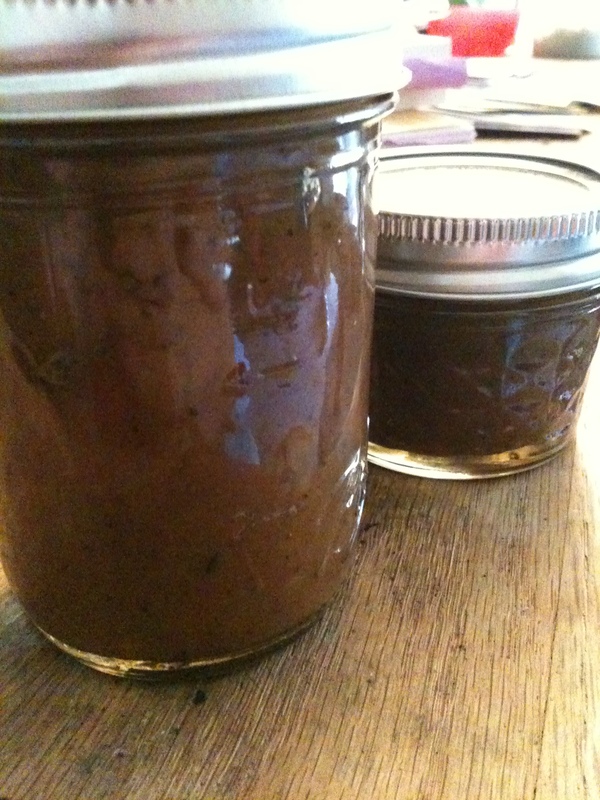 Note: the USDA says home canners should never ever ever can pumpkin, period. I have found several reliable recipes for pumpkin apple butter — heavy on the apple — and that’s what this recipe is based on. If you are nervous about it at all, just keep the jars in the refrigerator. I believe this recipe is sound for canning based on the apples. 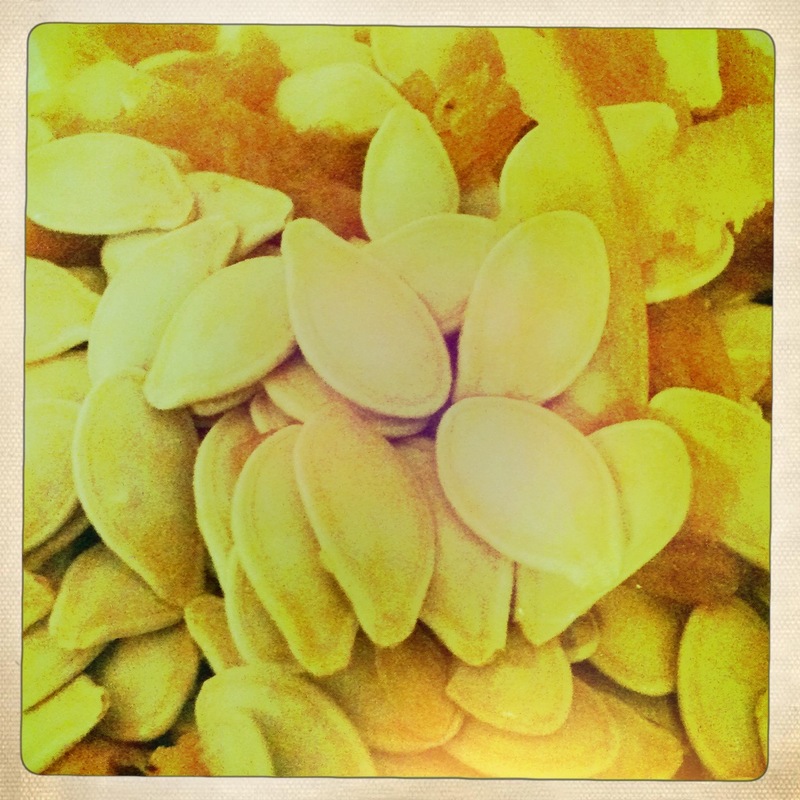 Don’t forget about the pumpkin seeds! These tasty morsels don’t have to be tossed. Roast them with olive oil and one of the following seasoning blends for about 20 minutes at 300 degrees.